Telestia online training courses for clothing skills are easy and simple to use. Download the free demo to get an idea of how simplified the training method is. Learn how to construct perfectly fitting pattern blocks and styles in a manner that is speedy, accurate and simple to use. 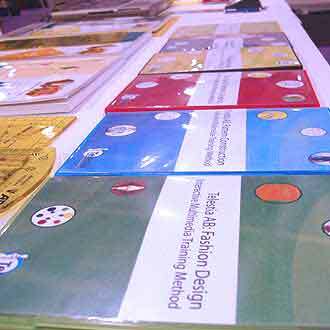 Learn creative fashion design through modern methodologies with the use of animation and videos. Get a glimpse of the unique training and reference tool for sewing techniques view one example of the process analysis in video and interactive multimedia (3D and 2D). View: You will be able to see and work interactively in one operation 3d and 2d process analyses of the flat collar. You will find this at the top of the right hand menu. Telestia Creator Pattern Making Software introduces a unique system of drafting the pattern for you: the Automatic function! Learn how to grade styled patterns 3-Dimensionally with unique method in a manner that is speedy and accurate. *Note: eTelestia, will not use or transfer personally identifiable information provided to us to third parties. We may use this information to communicate with you, such as to notify you when we are making a special offer to you or when we make changes to our subscriber agreements, to fulfill a request by you for an online newsletter.